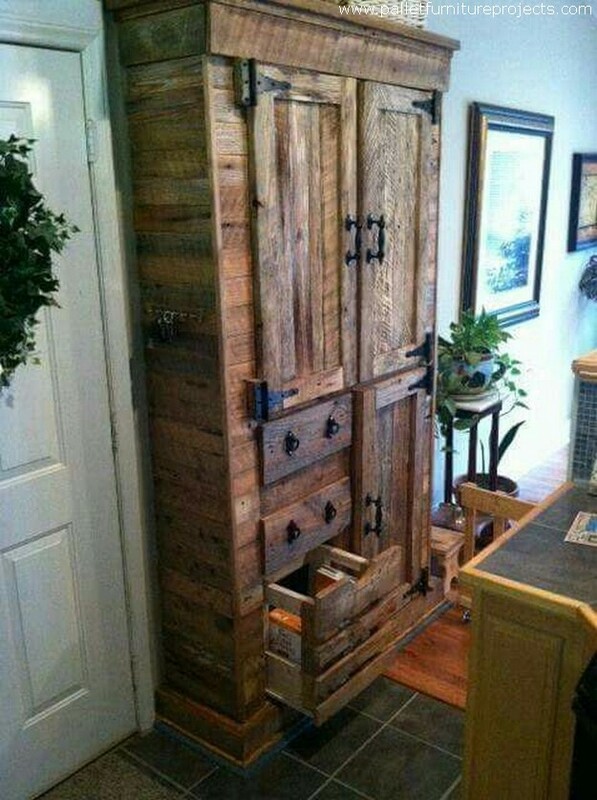 Hey guys, are you prepared for this new idea where we are just desperate to make a whole bunch of different storage cabinets that are going to be used in your house all around? I think this is a pretty interesting idea to go for. I have arranged for a number of different cabinet ideas that are mixed, I mean some of them are going to be used in your kitchen, some in the bedroom, and the rest in other portions of the house. But they won’t be mere decorative articles, but they are going to help you out with many of your storage issues that are pretty problematic. The very first wooden pallet recycled storage cabinet is very finely sanded and stained, finally a shiner was also applied to ensure the outlook. 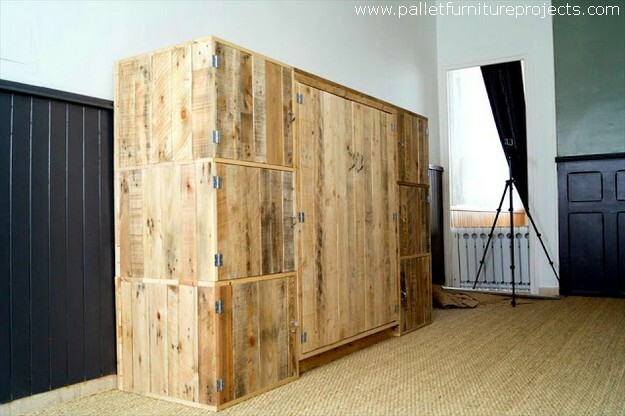 That is why several flaws in the shipping wood pallet are camouflaged to a large extent. 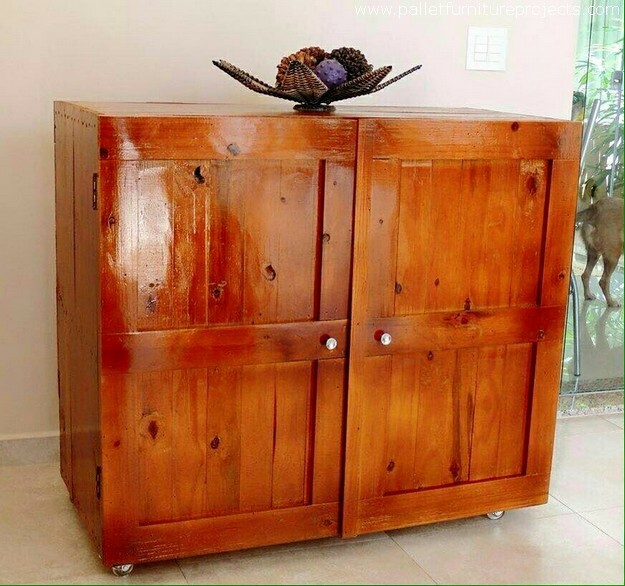 This grand vintage wood pallet cabinet can certainly be used for stuffing inside a lot of material that couldn’t make its place in rest of the wooden furniture items. We have kept the design quite classic, this actually reminds us of the renaissance era. 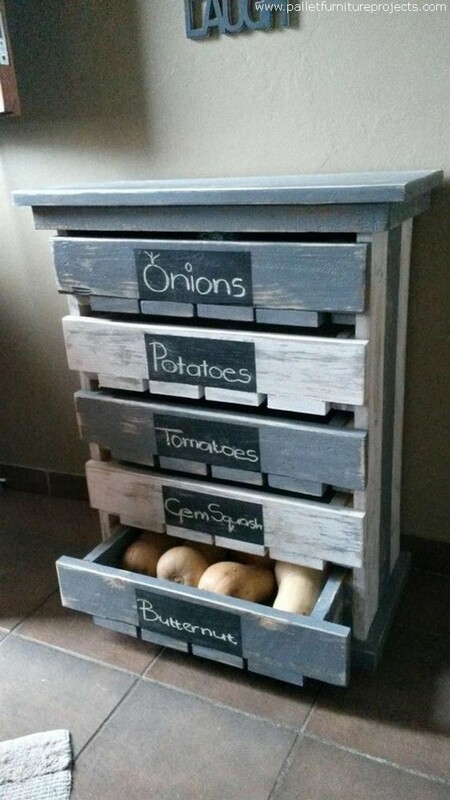 Wow, I really appreciate the wood pallet crater who has actually executed this plan of wood pallet storage cabinet. This is not carrying the usual stuff like clothes shoes and other accessories, but this time this is doing more creative job. Yes, it is carrying hygienic vegetables for us. Each drawer is tagged to add more convenience. 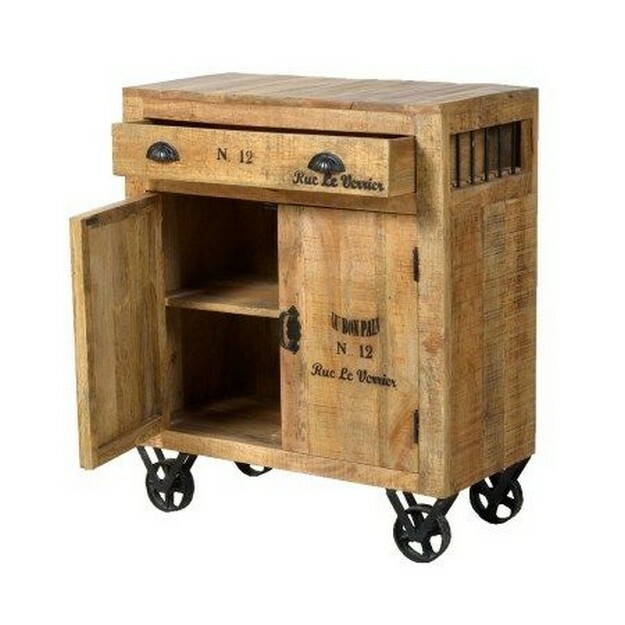 Awww… do you see the heavy metallic wheels on the base of this movable wood pallet storage cabinet? Well, they are certainly reclaimed from a vintage furniture item that was dumped long ago. 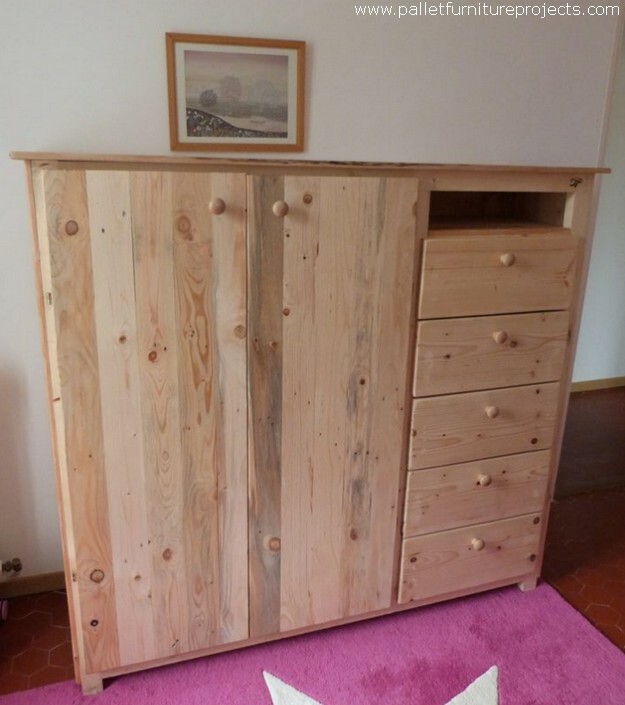 And the structure of the cabinet is made with the raw shipping wood pallets. 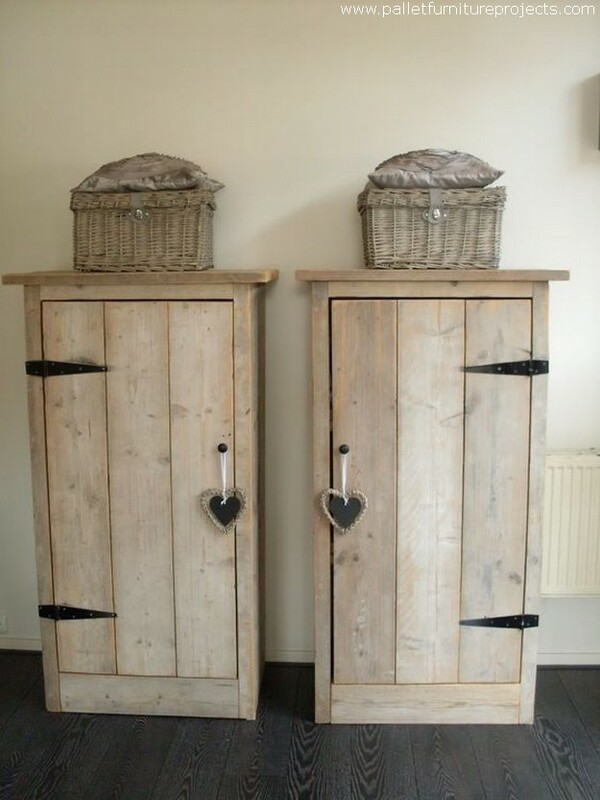 Here we can see a more typical and common design of the cabinets that we usually see around us. Isn’t this something that we are pretty familiar with? 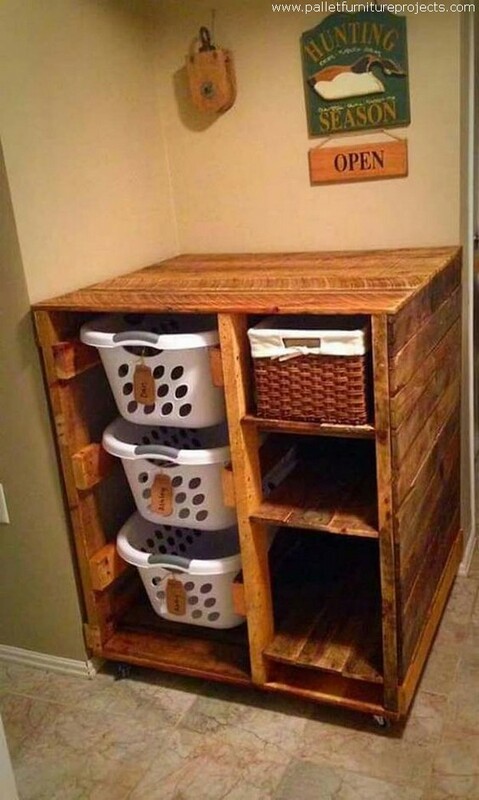 The good thing about this is that it has got the storage space below, while the upper wooden slabs are ideal for displaying the decoration pieces. Now this one really deserves all the appreciation and admiration. 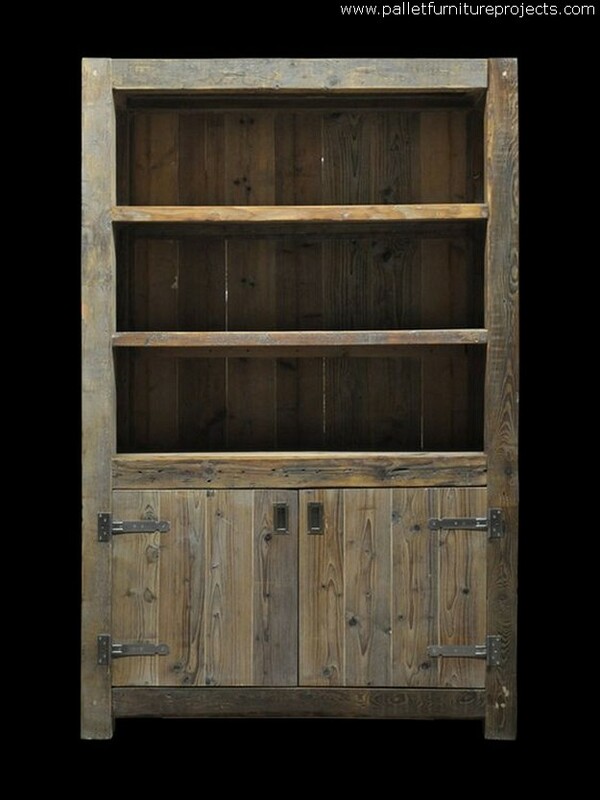 This could be an ideal storage cabinet for a kids room, the knobs on the drawers are very beautiful, the drawers are reasonably sized, plus the whole cabin is covered with giant doors that certainly offer a lot of space. Does it look more like a decorative wooden pallet furniture item? Yeah this certainly is man, we made it this way deliberately. Do you see the unusual knobs? And also the rest of the design that is pursued here, this pair again looks perfectly suitable for the kids. And this one on the end seems like a whole room is turned into a wooden pallet cabinet, isn’t that a bit excessive in size? But there might be some users who are going to love it because they have got so much stuff left with them which they actually want to place inside this storage cabinet.